Smoothies. Gotta love them. But sometimes, actually, I don’t. See, I like my smoothies simple. And these days there are LOTS of varieties of ingredients to include in your tasty, superfood smoothie. 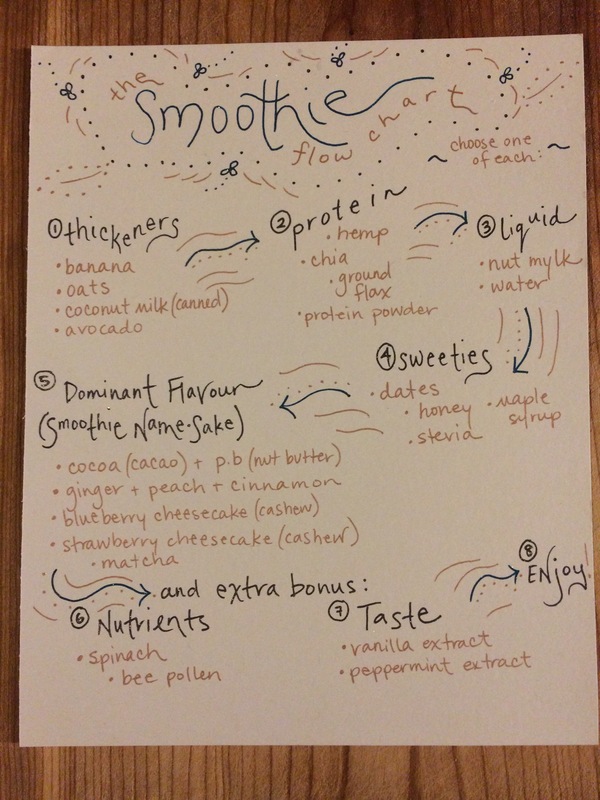 So here I’ve broken down some of the patterns that I’ve noticed in the smoothie recipes of certain nutritionistas. Fall is here in full force and with it came a desire to really hunker down and create some wonderful food creations in my kitchen! After going apple picking and also picking up some apples my parents had received from my uncle’s farm, I decided to use my apple abundance to make some highly sought after apple butter! Apple butter can be used as a sugar substitute in your favourite baking recipes, slathered on a sandwich, drizzled over oatmeal, or really in any other creative food context you can think of!! 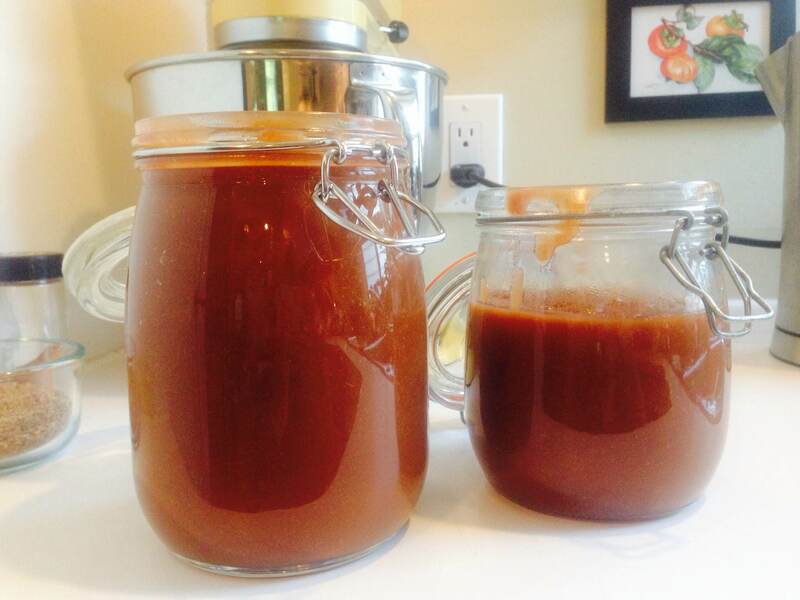 Two autumns ago, I bought my first jar of apple butter at a local farm north of the city. This apple butter did not end up quite the same (thicker and more sticky and dense), which is expected. I didn’t want it too! Mine was a little thinner and runnier. But just as nutrition-filled and TASTY! **I got the main gist of the recipe from my FAVE vegan recipe blog, Oh She Glows!! This woman knows what she’s talking about. 🙂 But of course I adapted it to my own liking, adding more spices and cooking it for longer. 1. In the evening, cut up all your apples, leaving the skin on (especially if they’re organic – those non-organic guys are sprayed heavily!) Using an apple corer if you have one is brilliant. 2. Fill your slow cooker with apples until you can’t jam any more in there. Add a cinnamon stick, one whole star anise pod, and finely grated nutmeg, and a teaspoon of course salt. 3. Turn your slow cooker on low and leave it on (overnight) for 8 hours. 4. In the morning, first stir the apples, it basically looks like you have apple sauce! Remove the cinnamon stick and star anise pod and BLEND your apples in your blender, I had to do it in two batches. Blend it well on liquefy for a good amount of time. 5. Put the blended sauce back into the slow cooker for another 1.5 hours! You can leave it longer if you want it to thicken up more, but remember it will thicken up in the fridge a little. 6. Jar it! Two mason jars will fit it all. 1. In the melted coconut oil, sautee the onion in the bottom of your largest pot. 2. Add the chopped sweet potato and pear, let it cook for 8 mins. 3. Add paprika, thyme, and veggie broth and water. Bring to a boil and simmer for 15 minutes or until sweet potato is soft. 4. Turn off element and let it cool a little before you use your stick blender to blend the mixture. Alternatively, you can use your blender. 5. Once well blended, add coconut milk, lime juice, and salt and pepper and stir. 6. Serve with some rice crackers, rice cakes, or tortilla chips! Enjoy. Just made this sweet and warming smoothie for breakfast! It will keep me full for as long as possible. 🙂 Big day ahead today! 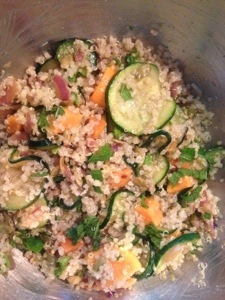 I made this tasty dish for my hubbie and I on this beautiful end-of-summer evening! Inspired from the September 2013 Martha Stewart magazine. 1. Preheat oven to 350 degrees. Scrape seeds and soft flesh from zucchini and save. Place zucchini, cut side up, on a baking stone and drizzle with olive oil. If you are pressed for time, throw zucchini in the oven now while you’re doing step 2 (for about 10 mins). 2. Heat oil in a large skillet over med-high. Add beef and onion and cook, breaking up beef until beef is just browned and onion is soft, about 5 mins. Add garlic and zucchini insides and cook until fragrant, one min. Remove from heat; stir in remaining ingredients. 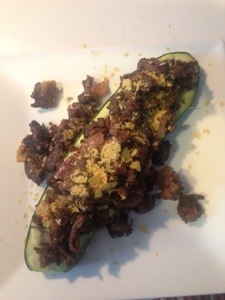 Take out zucchini from oven (after 10 mins) and divide mixture among zucchini, even until overflowing if necessary. 3. Bake until filling is firm and zucchinis are tender, another 25 mins. Garnish with cheese or nutritional yeast! Enjoy! P.S. I overcooked our meat, and since everything bakes after, feel free to undercook the meat in the skillet. 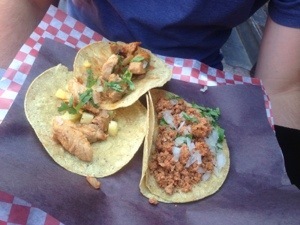 My love and I ate at Pancho Y Emiliano on Saturday after a lovely yoga class outside on the deck of the Thompson Hotel! The sun was hot and we were well stretched out! I just had to share this Mexican feast we delighted in! 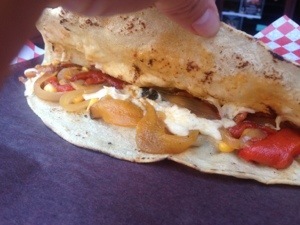 I had the Rasa Veg Quesadilla and Honey had the Soft Taco. 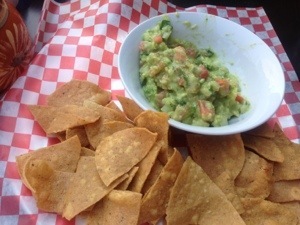 And then the guacamole to share which was simply delicious! May you all enjoy the last summer days!! Today I made this delicious salad for lunch for Andrew and I, and I am surely adding it to my summer recipe collection. I was inspired while reading my Martha magazine this morning over breakfast. I changed the recipe a little, but most of the credit still goes to the incredible Martha Stewart! Please let me know what you think if you try this out! The first thing I wanted to share with my not-so-large follower base is this; an unbelievably tasty Mexican dish that my beautiful husband created for lunch yesterday. So without further adieu, here’s the recipe. Andrew dreamed this one up – a classic typical daily meal for him, but I call it sheer genius. He is unstoppable!!! -Melt the butter on medium in your cast iron frying pan. Chop up the onion into long strips, and throw them in. Let them sit, you are making caramelized onions!!! Cook them like this for about 10 minutes until they brown and caramelize. Add a little extra butter if you need. I think they taste a little bit like heaven. -While the onions are doing their thing, chop up the tomato, and grate the cheese. 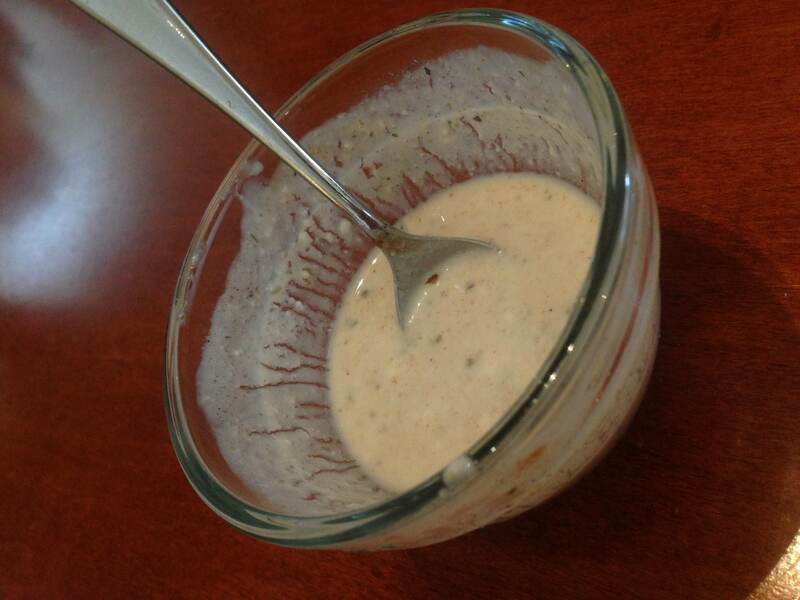 -Make the dipping (slathering) sauce: combine all ingredients in a small dish and stir together. Add more of anything if the taste is lacking. 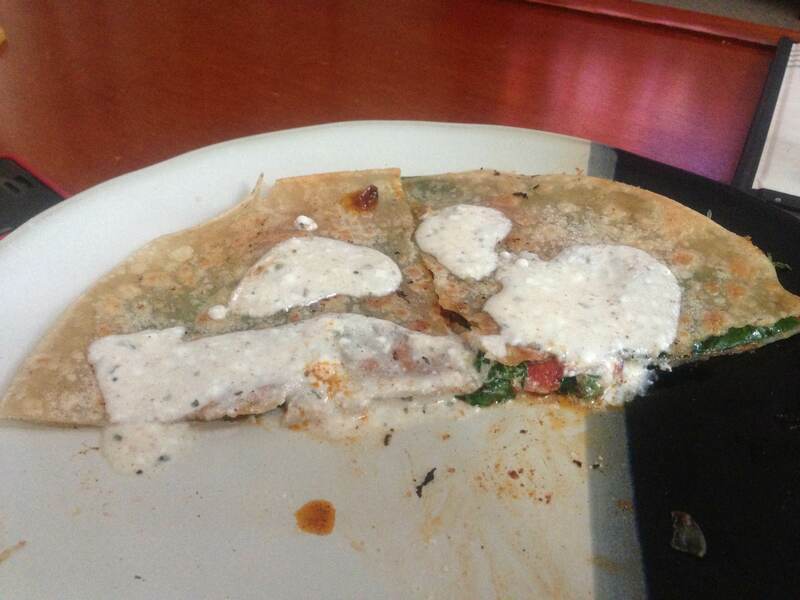 -Lay one tortilla on each plate and spread 1/4 of the cheese around on each tortilla top. Then lay the handful of spinach and tomato on top. When the onions are done, throw them on there, and then the rest of the cheese again. Put the other tortillas on top. -Drizzle the sauce on top and ENJOY! I am aware that this doesn’t look incredibly appetizing and it definitely doesn’t meet Andrew’s presentation requirements. But to be honest I was so hungry and it was so good, I didn’t have time to take a picture before taking a bite. But let’s face it, sometimes it doesn’t matter what food looks like, as long as it tastes good.